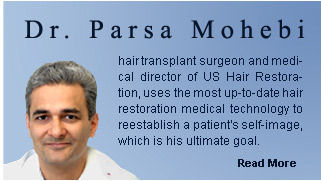 Laser Hair Restoration has been a debatable topic in recent years. People have had skeptic thoughts and remarks on these products while others have claimed full hair restoration. The topic of hair restoration by laser is one that many hair transplant surgeons have reviewed and are still evaluating to date. Hair restoration by laser or laser comb has not submitted enough substantial evidence of actual hair restoration through its methodology. Although it has been FDA approved, it does not mean that the products will work. FDA approved means that they are safe to use but does not guarantee success through its use. The approval of laser or laser combs by the FDA, only states that these products have been deemed “safe” to use and it does not guarantee their efficiency. Unlike laser machines for hair restoration and laser combs, medications such as Propecia and Rogaine have been studied thoroughly and have been proven effective in the use for hair restoration. US Hair Restoration only recommends the use of approved and well studied products or medications like Propecia (finasteride) and Rogaine (minoxidil). Prescription of these medications should be done after physician evaluation either along with hair transplant surgery or by themselves as a means of hair restoration.